A forest is an area of land with many trees. Many animals need forests to live and survive. Forests are very important and grow in many places around the world. They are an ecosystem which includes many plants and animals. 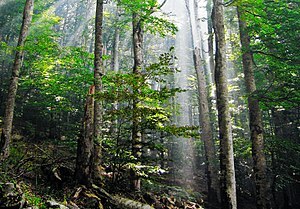 Deciduous forests grow in North America, Europe, and Asia. They have a moderate climate during the spring, summer, fall and winter, with rainfall of at least 500mm a year. Summers are warm and winters are cold, but not as cold as the northern coniferous forests. In the winter, snow covers the ground and all the deciduous trees and plants lose their leaves. The decaying leaves help make the soil rich in nutrients. Many insects, spiders, snails, and worms make their homes in this rich soil. Wild flowers and ferns grow almost everywhere in the spring. New leaves capture the energy of the sun and sprout before the tall trees grow too thick to let the sun reach them. During the winter, birds migrate, snakes and frogs hibernate, and raccoons spend the coldest months sleeping in their dens. Raccoons will only come out of their dens when the weather is warm. Some of the other animals also hibernate or simply slow down their metabolism and eat food they stored during the summer and fall months. The trees in the winter are brave, but with the coming of spring, leaves sprout, birds return, animals are born, and all the forest animals get busy with their lives. Animals that we may see in this biome are bears, white tail deer, raccoons, otters, beavers, fox, frogs, squirrels, snakes, salamanders, eagles, and birds such as woodpeckers, robins, and blue jays. Tropical rainforests grow in South America, Congo, Indonesia and some nearby countries, Hawaii, and eastern Australia. Tropical rain forests are aptly named, as it rains here on about half the days. The only season in a tropical rain forest is summer, so plants grow for all 12 months of the year. Trees are tall and thick in the rain forest and they grow so close together that they seem to form a big umbrella of greenery called a canopy. This blocks out most of the sunlight. The air is muggy as it filters through the dense canopy cover of the trees. The light that filters through this tree cover is dim and green. Only along river banks and in places that have been cleared does enough sunlight allow plants to grow on the forest ground. ↑ Blue Planet. McGrawHill. 2010. This page was last changed on 10 November 2014, at 11:55.